US brand Calfee have been making carbon fibre frames for over two decades and they added bamboo bikes to the roster four years ago. And when we say bamboo bikes, we don’t just mean they’ve pulped a few sticks and added a dash of the fibre to their carbon mix. No, far from it; the tubes of this bike are lengths of bamboo, complete with distinctive lumpy nodes – the knobbly bits that the buds grow out from. The bamboo has been heat treated – not unusual in bike frame manufacturing – and smoked – slightly less common – to prevent it splitting, and is coated with polyurethane to seal it, while the lugs are made of hemp fibre. There is metal, of course, principally in the shape of the rear dropouts and inserts for the headset, seat post and bottom bracket, but this is an organic-looking machine, if that’s not a contradiction in terms. Our 56cm model was built to Calfee’s Pro road racing geometry – a fairly aggressive flat-backed setup with a 15cm tall head tube and 73.5°/73° frame angles. It’s also available in cyclo-cross, time trial/triathlon and mountain bike configurations. You can even get a bamboo tandem and, believe it or not, a Goodies-style triple – although we’re going to go out on a limb here and say that demand for three seated bamboo bikes is fairly limited. Each frame is unique – well, you try telling bamboo to grow to a standard wall thickness – so weights vary from 4lb (1.8kg) to 6lb (2.7kg), ours hitting the scales at just under 20lb (9.1kg) completely built up (including pedals). The workmanship is gorgeous throughout and the attention to detail is superb. 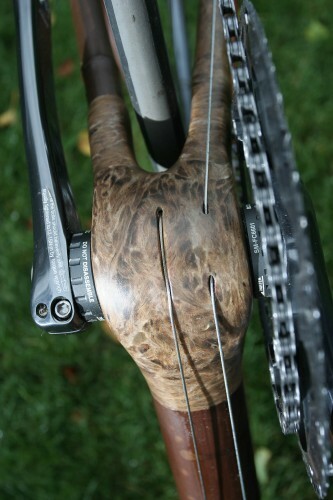 For example, the cables run through the head tube with the cable stops integrated within the frame. And rather than a plastic cable guide bolted to the underside of the bottom bracket, the cables run inside the BB shell. It’s a great piece of craftsmanship and about as neat as you’ll ever see. All parts are off-the-peg and in our case that meant a full Shimano Ultegra groupset and wheels, Ritchey Pro Carbon forks, WCS Carbon Evolution bars and WCS 4-Axis stem. This setup costs £3,499 while a 105 version is priced at £3,250. You could opt to buy the frame alone for £2,349 or go for a custom build. The obvious question is: why on earth would you want a bike frame that’s made from bamboo? Well, it’s certainly different. You’re pretty much guaranteed to be the only person on your local club ride aboard a perennial evergreen. And everyone loves the looks. We’d been outside the front door of the road.cc office for, ooh, all of five seconds when a stranger walked past and said, “Nice bike; what’s it made of?” You get a lot of that – every time you stop at traffic lights or catch another rider out on the road, in fact. A great conversation piece, a nightmare if you aren’t the chatty type. Calfee also boast that, “If there were an award for ‘Bicycle with lowest carbon footprint’ (least amount of carbon dioxide emissions in the production of the frame), this frame would win, hands down”. They’re probably right, and it’s shipped rather than flown over from the US to boost its eco-friendliness. Plus, resources don’t come much more renewable than bamboo – it can grow at over a metre a day (just let us know when you’ve had enough of Wikipedia’s bamboo facts). And Calfee use only bamboo that has been sustainably harvested. Okay, you’re impressed by its green credentials, but how does the bike ride? Although not a heavyweight, the Calfee isn’t especially light either and that’s reflected in its acceleration. It winds up to speed okay – it’s not sluggish, but it doesn’t set your senses on fire. It’s a similar story on the climbs where you find yourself having to work that little bit harder to stay with ride-mates than you would on a bike a couple of pounds lighter. And there’s a noticeable degree of sideways flex at the bottom bracket when you get out of the saddle that takes some getting used to. It’s not a crazy amount of movement but you certainly don’t get the stiffness of a similarly priced carbon fibre frame. What you do get, though, is a hatful of comfort. Calfee claim their bike has even more vibration damping than carbon so we decided to test it properly by doing a century ride first time out – in for a penny and all that. The result? It feels great. Along with the carbon fork and cockpit, It smoothes over rough road surfaces beautifully and stops unavoidable potholes jangling your teeth loose. It’s a very comfortable bike. It might not have the all-out speed of a lightweight whipper-snapper, but you’ll be happy enough to sit in the saddle and keep the old legs spinning all day. If that’s what you’re after, give it a go. You can even hire one for a while from the UK importers (www.rawbamboobikes.co.uk) to help you make up your mind. One thing we really don’t know about is how well the Bamboo bike will cope if you stack it. Calfee reckon it’s ‘crash tolerant’ but, let’s be honest about this, we haven’t got a clue. It might be bulletproof; it might turn into kindling. We didn’t think that testing it on that front would go down too well with the suppliers. It does come with a 10-year warranty, though, which should go some way towards setting your mind at ease when you’re out on the road. Calfee say, "This is not just a cool bike. It is appropriate for everyday use and for racing. The vibration damping is a performance advantage on longer rides." We agree that this bike does offer a smooth ride that keeps you feeling fresh but in terms of stiffness for a given weight, it doesn't rival carbon fibre. In purely performance terms, you probably wouldn't choose this bike. It's more the fact that it's bamboo – it's different from the norm, it's a green choice, it looks great – that might attract you. The rating is fairly arbitrary because it's a unique frame. The build quality is superb. A whole lot of work goes into creating this bike. The bamboo is grown in Taiwan. The tubes are joined with hemp fibre. Our bike is built to Calfee's Pro road racing geometry. Our 56cm model has a 56cm top tube, 15cm head tube and 99cm wheelbase. The head angle is 73.5° and the seat angle is 73°. Other geometries are available: triathlon/TT, cyclo-cross and mountain bike. There's nothing too unusual about the geometry - it's a typical race-inspired road setup. The front end is a medium height. Yes, the most impressive feature of the ride is its smoothness. Very comfortable. We didn't find it incredibly stiff around the bottom bracket. It's not wet spaghetti by any means, but it's not at the top level for frame rigidity. It didn't feel as efficient as a carbon fibre bike of a similar price, especially when we got out of the saddle. We felt it was a pound or two overweight - which was especially noticeable on the climbs when we'd lose speed a little more quickly than normal. But, on the plus side, it's comfortable enough to keep you feeling fresh all day long. Our bike came without a post and saddle so we fitted our own. We got on well with Ritchey's cockpit components which provide plenty of front end comfort. We like Ritchey's Pro Carbon fork for its light weight and shock absorbency although it's not the stiffest we've ever used. The Ultegra wheels are reasonably taut and they should prove durable as long as you treat them right. Efficient power transfer isn't this bike's strongest suit. The Shimano Ultegra wheels aren't the liveliest out there but they're good workhorses. We like Shimano's hubs which last well as long as you adjust them correctly.